New Event First Purchase Chest: Get Angel’s Treasure Timely! 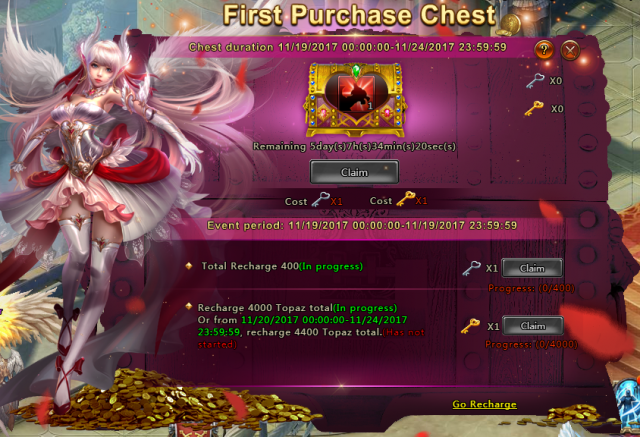 League of Angels II is glad to introduce a brand new special event called First Purchase Chest. In this event, players can earn some rare items such as Azurous Hyper Evo Core in a limited time by fulfilling specific conditions. First Purchase Chest will be online on Nov.19th. In order to join in this event timely, let’s hurry up to learn more details about First Purchase Chest below! Access: Click the ”First Purchase Chest” button on the left of the game screen to open the event panel. There will be one hot item in the chest for players to claim with both Silver Key and Gold Key in each First Purchase Chest. This event will be divided into 2 phases. During the first phase, players can get Silver Key and Gold Key after fulfilling specific conditions. This phase will be available on the first day of the event. If you want to open the chest, don't forget to get the Silver Key in this phase! Players can only collect the Gold Key in this phase. After collecting both silver key and gold key, player enables to open the chest and claim the reward. PS: Silver and Gold Keys will be removed after the event ends. Please note that the above content might be adjusted due to changes of the development plan. Final updates will be determined in game. If you have any suggestions regarding First Purchase Chest, please leave us a comment below this thread and make your voice heard!